5793 labyrinths found. Showing 1541-1560. Sorted by country, state, city, then zip/postal code. 7 circuit labyrinth built of lichen-covered basalt rocks gathered on site. Large rocks in center circle can seat 10 people. Near the corner of Lone Tree and Sawmill Roads. Accessible from children's play structure in Sawmill Park (walk south 200 ft), from The Culvert on the Arizona Trail (walk west 100 ft), or from Yellow Line bus stop 15 (walk 100 ft north, then 200 ft east). A solitary moment of meditation and reflection. 15300 N. Fountain Hills Blvd. Located at the corner of Fountain Hills Blvd. and Glenbrook Blvd. 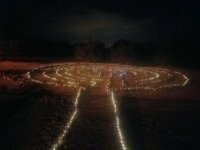 There is no landscape lighting, so bring a flashlight to walk the labyrinth at night. The Labyrinth at The Fountains was designed by Taffy Lanser (www.lanserlabyrinths.com) and built by volunteers at the church in 2008. Northwest corner of Fountain Hills Blvd. and Glenbrook Blvd. 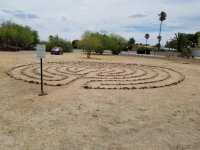 The Heart of God Labyrinth is located in northwest Phoenix, AZ approximately 1.3 miles west of I-17 Freeway in the southwest corner of the intersection of Happy Valley Rd. and 39th Dr. The labyrinth is located on church grounds directly south of the sanctuary and is accessible from 39th Drive. It is completely wheelchair accessible and is open to the public at anytime. This labyrinth is based on the traditional 7 circuit design with a unique heart shaped center to symbolize our journey to the "Heart of God." Each labyrinth path is approximately 55 inches wide and is wheelchair accessible. The labyrinth perimeter is completely landscaped with arid desert plants and a drip irrigation system. Large mesquite trees border the labyrinth to provide shade. Two concrete benches have been placed near the labyrinth to provide a resting place for prayerful contemplation. The labyrinth path is outlined with solar lights making it available all day and night. The labyrinth is a 6 circuit Jericho design with seven walls of river rock. The entrance is from the south. 3444 E. Desert Storm Ave.
Highway 92 South from Sierra Vista, AZ to Ramsey Canyon Road. Right on Ramsey Canyon, one block to Mir Way. Left on Mir Way, one block to Desert Storm Ave. Right on Desert Storm. 3444 is the third house on the left from the corner of Mir Way and Desert Storm. The labyrinth is available for walking during day light hours with permission of the private owners. Please park on the side of the road and walk up the driveway. Eleven circuit, left-handed Chartres labyrinth. 90 miles SE of Tuson between Sierra Vista and Bisbee. From Hwy 92 take Palominas Rd north exactly 2 miles to a right turn on Waters Rd. Casa de San Pedro is located on the San Pedro River at the end of Waters Road. Beautiful desert labyrinth. Peaceful & quiet, perfect for contemplation. Views of the surrounding Huachuca mountains. Happy Labyrinth Building Day! HUGE thank you Susan for coming up and helping us make the world a better place! Pocket Park 1st St and Erie SW corner. The labyrinth is part of a Tranquility Garden that a group of girls are creating as part of their Silver Award Project. 34 54.339 N° Lat. ; 110 09.168 W° Long. At the bottom of School Hill. The entrance to the Desert Garden where the labyrinth is located is in the parking lot of the Church of The Good Shepherd, a United Methodist Church associated with the Episcopal and Evangelical Lutheran Church in America. Our labyrinth was designed to fit the contour of the Sonoran desert where it is situated. 11-circuit Chartres replica. Desert design with seating and shade. Access and street parking available on Old Litchfield Road or off Desert Road in the church parking lot. There is landscape lighting; however, the lighting is minimal before sunrise and after sunset. Finger labyrinth also available outside at all times without appointment.